During the Korean War, two jeep loads of U.N. soldiers drive right into an "Ambush!" 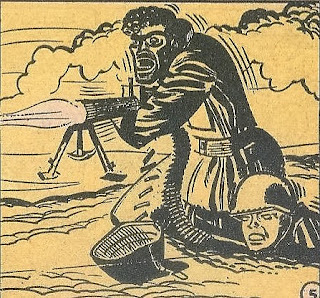 A soldier nicknamed Lucky credits his good fortune and survival to a Kewpie doll he keeps tied inside his helmet. One by one, every other soldier in both jeeps is killed by North Korean gunfire or grenades, but Lucky manages to wipe out the last of the enemy soldiers. When other U.N. troops arrive and ask him what happened, he takes off his helmet to show them his good luck charm, only to discover that he had unknowingly switched helmets with one of the dead men. 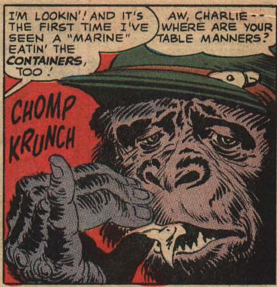 I don't usually associate Jack Davis with war stories, but this one's a doozy. It's violent and realistic and I really enjoyed it. "Pigs of the Roman Empire"
Commander Decius, one of the "Pigs of the Roman Empire" who is stationed in Carthage, loves wine and treats his fellow men with cruelty. After sentencing a gladiator to death, he hears that the Vandals are approaching and assembles his army in an open field. His first line of attack seems to vanquish the vandals, but they outsmart him and rout the Roman Army. Decius retreats into the desert to head for Alexandria, unaware that the skinful of wine he takes will cause him to die of thirst on the barren sands and end up food for the buzzards. I love to read about Ancient Rome and I gobbled up this little history lesson where Kurtzman posits that the Roman Empire fell due to the cruelty and debauchery of its leaders. It's December 1940 and the S.S. Bunker Hill is making "The Murmansk Run!" across the Arctic Circle to bring supplies to the Russian Front. A sailor named Bragg is chastised for smoking on deck since German U-Boats are in the area and blackout regulations are in force. After getting some rest below deck, he heads back up for another shift and secretly carries a sterno can to light and keep himself warm. His little light leads to a torpedo blowing up the ship, and Bragg gets all the heat he can take as he dies in a blazing inferno. 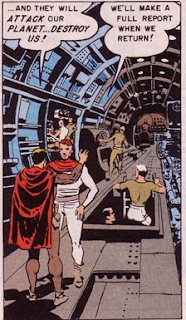 Not Wally Wood's best work, but another fascinating slice of wartime history. Peter: "Ambush," "Murmansk" and "Search" are all dark and violent war stories, the likes of which we haven't encountered in our bi-weekly overview of DC's post-code war comics. Davis's art in "Ambush" looks a bit murky; though I've seen no mention in any of the EC reference books I own, could Kurtzman have had a hand in inking this one? 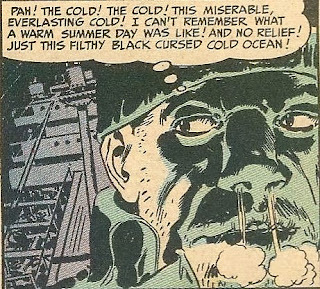 Some of the panels have that unmistakable Kurtzman style. 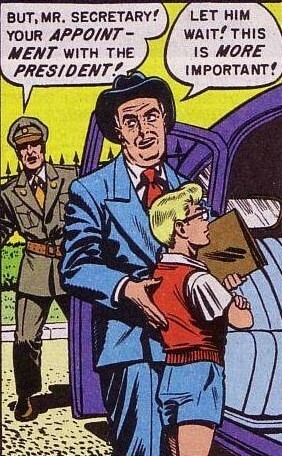 The dialogue in all three is exemplary, especially the exchanges in "Search" between Joe and the Kid. The conversations just flow, with nary a false note. The oddball in an otherwise military-themed issue, "Pigs of the Roman Empire," is an interesting and involving history lesson; Max Brand used the same climactic twist in his excellent short story, "Wine on the Desert." Harvey will script every single TFT story until relief, in the form of writer Jerry DeFuccio, arrives in mid-1952. This is a good thing. 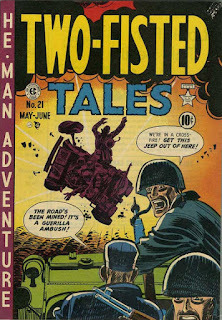 Two-Fisted Tales just gets better and better. Jose: Even when compared to some of the weaker (and nearly infirm) stories that cropped up in this batch of issues, Two-Fisted Tales #21 has to be counted as one of the most all-around solid left hooks that we’ve seen yet. This isn’t to say that #21 is fit to bursting with masterpieces but that, perhaps more than any other title in EC’s stable of “New Trend” magazines at this point in time, Two-Fisted Tales feels as if it is fully within its element, most likely due to Kurtzman’s deft editorial control. “Ambush” channels the tension of battle and inevitability of death before delivering a cold smack of reality with Lucky’s discovery that the fortune of his namesake is completely arbitrary. “Pigs of the Roman Empire” may be leaner on character, but the grim righteousness of the finale that finds Emperor Decius boiling with thirst from the vinum that he so treasures gives the tale the touch of Biblical parable. Both “The Murmansk Run” and “Search” are anchored by the weary machismo of their protagonists, two men who have been beaten down by ceaseless journeys tagged with the constant fear of enemy attack. The climaxes to both stories bear the weight of unseen tragedy. Bragg’s fiery demise in “Murmansk” may be a typical EC comeuppance for him, but what of all his innocent crewmates? The finale to Joe’s tireless “Search” for his brother is left to the reader’s imagination, but the options aren’t bright. Which will our soldier hero die by first: gunfire, exposure, or disappointment? John: "Ambush!" sure seemed to me to have that Kurtzman artistic touch that I've found so hard to swallow. "Pigs of the Roman Empire," on the other hand, was not only nice to look at, but an interesting diversion from the standard war stories within the pages of TFT. The top brass in Washington, DC, are shocked when a jalopy from Oak Ridge, TN, pulls up at the White House. In the back seat is Rufus Tatum, a "7 Year Old Genius," who quickly demonstrates that he knows more than all of the grownups combined. Naturally, the big wigs beg him for the secret to the H-bomb, but he holds off, especially once he discovers that it will cause a chain reaction that will destroy the earth. Why is Rufus so brilliant, you may ask? It seems his hayseed father was the janitor at the Oak Ridge Atomic Laboratories and he was exposed to radiation, causing his son to be an atomic mutant. When war comes, Rufus gives incorrect instructions on how to build an H-bomb, but scientists figure out the right way to do it. Rufus happens upon an issue of Weird Fantasy and decides to tell his story to the editors, who print it and hope that Rufus is wrong about the H-bomb, which is set to go off next week. Al, Al, Al! 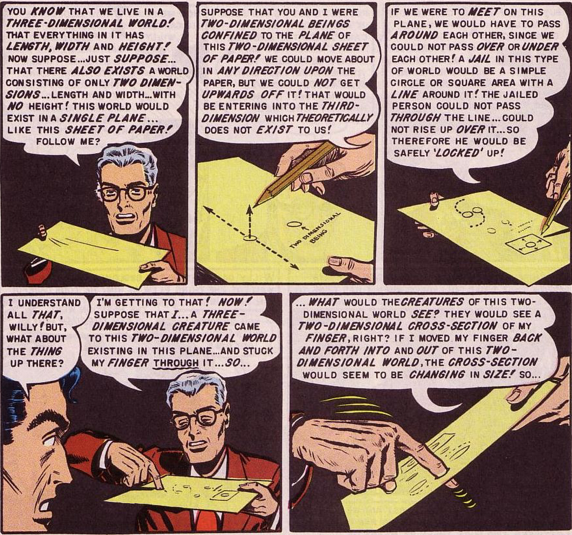 Haven't we had enough of the ironic, self-referential atomic bomb stories by now? This is a tired and obvious retelling of the sort of tale that got old very quickly. Just what is the gal in red up to, and why is the guy smiling? Just as Stephen Lamb finishes typing his treatise on spiders, POW! Out of nowhere comes a gorgeous gal named Wanta. "Come Into My Parlor," she says--well, no, not really. Actually, she asks him to come back with her to the future, where a world of women live to serve man (you know where this is going). He jumps at the chance but soon finds himself tied to a spit over a fire, being prepared as the main dish for the feast. But wait! It was all a dream! Suddenly, Wanta appears from the future, and blah blah blah. Good Lord (choke! 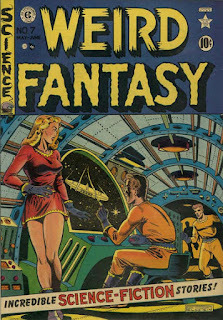 ), has Al Feldstein run out of ideas this soon? This does not bode well. The second attempt to send a rocket to Mars is aborted when the ship from the first attempt suddenly returns. 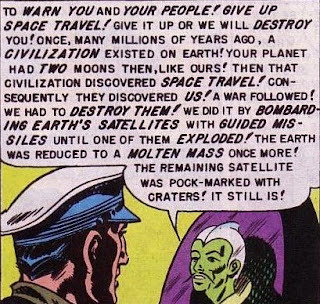 In a valiant effort to put the reader and his commanding officer to death by means of boredom, the captain of the first ship explains that he and his crew reached the planet of Bamuno, which is always directly "Across the Sun!" from Earth. The little chief of Bamuno told the Earth ship captain that Earth's space travel program will lead to interplanetary war, so the captain tells the C.O. that they'd better lay off the planned launch. If "Come Into My Parlor" was bad, this is worse. It's confusing and boring and the art by George Roussos would be barely adequate in a non-EC comic. Just stop talking and we promise never to explore space again! 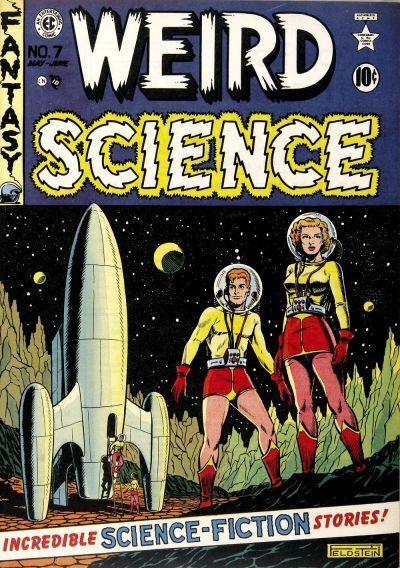 Wally Wood comes through in a pinch! Peter: With "Come Into My Parlor!," Al proved he could not only steal plot lines from established work, but also punch lines! Space queen Wanta tells new Romeo, entomologist Stephen Lang, just before she roasts him on a spit, that she will "serve man," a line "borrowed" from Damon Knight's "To Serve Man" (Galaxy, November 1950), a short story that would become famous when it was dramatized by Rod Serling for The Twilight Zone. I do have to give credit to Feldstein for not going down the predictable road at the climax; I was convinced Wanta would be revealed to be a black widow spider with a beautiful brunette-topped head. Similarly, the finale of "Breakdown" may be a tad familiar but surely that chestnut had never been so stylishly rendered as it was here by Wally Wood. I love the disclaimer when the aliens' true appearance is revealed: An accurate illustration of the monsters in this story is, naturally, impossible . . . as we feel it is preferable to preserve the sanity of both the artist and of you, our readers! Jose: If our humble editors really did give a fig for the readers’ sanity, then they likely would have tried to serve us something better than the coagulated oatmeal that is Weird Fantasy #7. When you feel your eyes start to roll and your stomach groan in sympathetic pain by page 2 of each story, you know you’re in trouble. There is precious little here that we haven’t seen before in tales that were already pushing their expiration dates the first time around. The cutesy snob of “7 Year Old Genius” can barely hold our attention for the length of a lead story before things turn decidedly meta (again). “Come Into My Parlor” is a walking tour through the male gaze jungle that seeks to redeem itself by roasting its chauvinist pig on a spit and then reneging on that tract by claiming that it was all a dream. (Except that it really wasn’t?) “Across the Sun” proves that no one has mourned the absence of George Roussos, and Feldstein honors the artist's return with an insipid script that tries to pass six panels of mindless dialogue off as an ending. The first four pages of “Breakdown” had me silently praying that this story would prove the much-needed death of the “monsters from outer space are posing as humans” trope for EC, but things took a grateful upswing with the introduction of the aliens’ mind-shattering physique. Barring the second-to-last panel, Wally Wood just manages to squeak by here with acceptable art, though perhaps we can give him a pass for rescuing so many derivative SF tales in the past. Life is anything but rosy for young Rodney Whitman, a boy who loses both parents to an automobile accident and then must contend growing up with his stern uncle and two selfish cousins. So obsessed is Rodney for the peace of the grave that his one and only wish in life is to occupy the sole space left in the Whitman family crypt so that he can lie right alongside Mom and Pop for eternity! But as he becomes a young man a horrible realization dawns on him: the space is more than likely to be taken by his old, ailing uncle before Rodney ever kicks the bucket. What’s a moribund neurotic to do? If you answered “Kill his way to the grave,” come on up and get your prize. It’s a simple matter for dear Rodney to bludgeon and smother uncle and cousins and an even simpler matter to abandon their remains at the bottom of lakes and mires so that their thieving corpses need ever rob him of his rightful resting place. But what Rodney doesn’t realize is that it’s also a simple matter for the slimy cadavers of his dead relations to rise up and enact vengeance upon their killer. With various parts of Rodney dispatched to the three makeshift graves, the corpse trio clambers into Rodney’s newly-purchased casket and reposes at last in the family crypt. For me, “Room for One More” represents Graham Ingels’s official ascension to the throne. 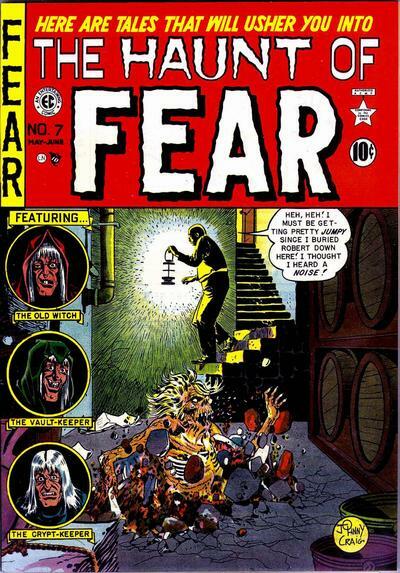 Here we have him yet again illustrating the lead story for The Haunt of Fear, a slot that was to become his own for the majority of the remaining issues, but “Room,” moreso than previous efforts like “A Strange Undertaking” (HoF #6) and “A Biting Finish” (HoF #5), feels like the genuine Entertaining Comics product that we’ve come to love. As Peter says, Rodney’s motivation is deliciously deranged (a murderer who kills to secure his own funeral arrangements! ), but Ingels’s art bestows the story with a Gothic earnestness that leavens the humor without extinguishing any of the fun. And those corpses! Those wonderful, ragged, dripping, wobbling, clawed corpses that Ingels did so well. It’s a testament that although we never see the revenants in close detail, Ingels still manages to make them look disgusting. Can I also say how much I love his splash panels? Such warped imagination: humanized bats with pitchforks, shrunken people imprisoned in shrunken heads, grinning goblins, that marvelously pop-eyed Old Witch. Okay; I’ll stop gushing now. Vincent Cabez causes more than a few eyebrows to rise every time he trundles into the Southern village he calls home to carry out his errands. After all, everywhere he goes he carries “The Basket” upon his shoulder, come rain or shine! Gossip inevitably brews in his wake, the old-timers of the general store claiming Cabez to be “loco,” while the barefooted tykes who greet Cabez on his way into town joke with him about the basket’s contents. After Cabez becomes ill and is recommended to see Doc Hawkins, his next errand run turns sour when he strikes a boy who tries asking him if he’s improved. A series of gruesome grave robbings convince the villagers that Cabez has become a mad ghoul and they make for his place to start a lynching. One coot who notifies the Doc of the events gets the full story: Vincent actually has a second, living, conjoined head upon his shoulders that he keeps from the public eye by hiding it in the basket, but after his recent illness the “evil head” took over to satisfy its lust for violence. Back at the cabin, the sight of two-headed Vincent stupefies the gathered crowd but, the good head winning out, Vincent grabs a shotgun from one of the assembled and ends his life. 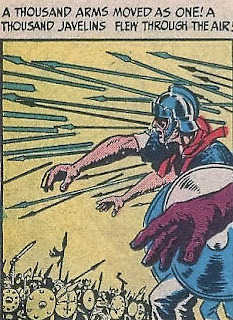 The plot twist of “The Hunchback” (HoF #4) is given the slightest of turns to create “The Basket,” and although Davis’s piece has a bit more regional flavor and conflict than Ingels’s earlier story, there’s not much here that will startle the reader with its originality. Davis, for his part, shows some areas of improvement with his white-bearded granpappys and scruffy tykes but has yet to really take off like he would when assumed the helm at Tales from the Crypt. Jack Kamen gives us one of his “wittle kid” stories in the form of “Horror in the Schoolroom.” Little Andy Field is constantly late to school, but as he tries to explain to prim, prune-faced Mister Witherspoon, he can’t help it if his friend Magog takes up all his time whisking him off to far-flung countries like Afghanistan and Italy. Witherspoon refuses to listen to such claptrap and commands the boy to stand in the corner and write out his penance upon the blackboard after school. Witherspoon makes a house call to the Fields residence, but all of Mrs. Fields’s explanations of Andy’s lonely home life fall on deaf ears, with the teacher threatening to whip the boy if he transgresses again. Andy tries to warn his teacher that Magog, his friend of the “long teeth and big eyes,” promised to punish anyone who would harm him, but Witherspoon ignores the protests and, when incited by the boy’s lateness again, takes Andy into the closet for a whipping. Answering the screams that follow, the other children look in and discover an unharmed Andy and the lone, gnawed-off hand of Witherspoon still gripping the rod. While Kamen’s tameness has been derided before, his style is perfectly suited to a story like this, and though we may never see the frightening entity that is Magog, the autumnal feel to his art and PG-rated violence give “Horror in the Schoolroom” some nice, family-friendly chills. Jack Kamen responds to criticism. Peter: Totally offbeat and goofy, “Room for One More” is another yarn from the seemingly bottomless EC Revenge Well, but this one has that extra zaniness to push it to another level. Then there’s the “Ghastly” Graham Ingels art. Ingels could make the worst tale readable, but when he was given something with substance, no one could touch him. He was the 1950s version of Bernie Wrightson. I love Johnny Craig’s art as well (though I think his stuff got better, as witnessed by his work for Warren in the 1960s), but just compare the results of Craig’s take on the story (on the cover) with the full story as drawn by Ingels. Craig’s art almost has a calm to it (despite depicting a corpse bursting through a basement floor) while Ingels oozes darkness and doom. Though the biggest influence on "Horror in the School Room" has to be John Collier's "Thus I Refute Beelzy" (right down to the mirror-image final scene), there's no denying the Ray Bradbury vibe in both "School Room" and "The Basket," the latter of which reminds me, in atmosphere, of Bradbury's "The Jar." It's eerie how close to Ingels Jack Davis comes on his splash for "The Basket." Though "The Howling Banshee" might have felt a little more comfortable over in Crime SuspenStories, it is, nonetheless, a solid thriller and closes out a very strong issue of HoF. Jack: "Room for One More!" is one of the best horror stories I've read so far in the EC line, though Ingels has some strange ideas about the size of the main character's hands in relation to his head. Is this the first time we've seen resurrected, knock-kneed corpses? I knew right from the start what the secret in "The Basket" was but the story was disappointing. I wanted to see Ray Milland and Rosey Grier's heads in the final panel! Peter is on target with "Horror in the School Room" having a Ray Bradbury feeling to it; I was happy to see Feldstein reach back to the Bible for his monster's name but I was unhappy that Kamen chose not to try to depict the creature. All we get is a severed hand! I love Johnny Craig's work but "The Howling Banshee!" is not his strongest tale. Poor Noreen sounds like an Irish Yoda when she spouts remarks like: "Sure, and 'tis willing I am te listen" or "'Tis frightened I am!" John: Despite a somewhat weak premise (I want the last spot in the family crypt), "Room For One More!" plays right to my weak spot and wins me over with a parade of shambling corpses. (Oversize) hands down my favorite story in this issue. If anyone doubted what was in "The Basket!" you need look no further than the character's name. Surely I'm not the only one who knew Mr. Cabez had a cabeza (Spanish for head) in his basket? "Horror in the School Room" was an interesting premise, but falls short in the realm of 'less is more' stories. I was really looking forward to seeing Magog meet the schoolmaster. "The Howling Banshee!" 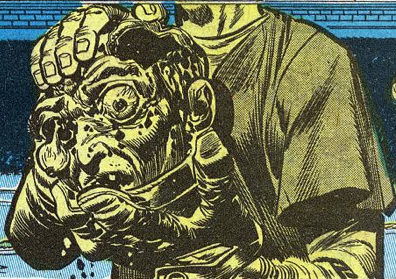 was the low point for me in this otherwise horror filled issue of HoF. One day, while tending to his farm, Hank Underhill comes across a peculiar sight: a giant, floating blob. The shape descends upon one of Hank's cows and absorbs it. In a panic, the farmer hops into his jalopy and heads for the home of his brother, noted scientist, William "Willy" Underhill. Hank excitedly describes the eerie events and convinces his brother to accompany him back to the farm for an assessment. Once there, the brothers are chased into Hank's storm cellar by the pulsating blob but at least this gives the scientist a chance to explain just what the phenomenon is. Luckily, Willy has been working on a machine that will bust through the fourth dimension; he's convinced this thing has somehow entered our dimension and is stuck. His solution is to use his own machine to enter the blob's world and destroy it with a "charge of dynamite!" The trip goes as planned but hits a snag when Willy obviously stands a little too close to the explosion; his body re-enters our world along with pieces of his machine. Good news is that the blob is dead. Bad news is that Hank has to sell the farm because the odor becomes too much for him. "You see, Timmy, when the world cooled . . ."
"It Was the Monster from the Fourth Dimension" could very well turn out to be the worst piece of drivel EC ever runs but at least it's entertaining . . . in the same way a really bad monster movie entertains. So much to love and roll your eyes simultaneously. Hank's brother, Willy, just happens to be a scientist perfecting a fourth-dimension taxi but Al doesn't think to maybe tie that in with the monster's appearance; it would certainly explain the coincidence if Willy had been responsible for providing the monster a doorway. A la Stephen King's "The Mist," there's a mention of a "freak storm which had ravaged the countryside the previous night," but nothing more is made of that. But never mind. Willy takes advantage of their down time in the storm cellar to explain in minute detail what's going on; the two-page break reads like fourth period Science with Mr. McKinney and is capped with the perfect explanatory: "If a fourth-dimensional creature came along and stuck its finger or its arm into our three-dimensional world, what would we see? A three-dimensional cross-section of this fourth-dimensional animal's extremity!" Makes perfect sense to me. Willy's such a smart guy that he blows the creature up but obviously didn't take the necessary precautions to assure a safe flight home for himself. And this guy is a scientist? My loudest laugh (amidst plenty of guffaws) is when Willy tells Hank he's going to his place to grab his Fourth-Dimensional Doodad and Hank needs to keep an eye on the ectoplasm from beyond until he gets back. 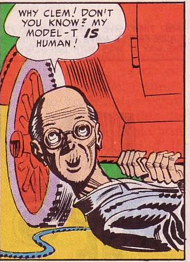 The next panel's caption begins: "Willy was back with his machine in two days!" Two days? With a world-threatening monster tethered to his brother's favorite elm? Did Bill have a lecture already scheduled? Traffic? Absent-minded? And, finally, what's with the babe who puts an appearance in on the splash and then takes a powder? Drink several alcoholic beverages before consuming. Al must have been on a roll this month as he follows one inane script with another. "Something Missing" chronicles the misadventures of professor Roger Lawrence, inventor of the "physio-chemical decomposer and re-aligner," a machine that will "break down any living thing placed within its force field into its chemical component parts" and then "realign these chemical components into new chemical components, thereby creating another object different in structure..." (just what benefits this machine holds for mankind isn't explored). Roger's shrewish wife would prefer a new dress but the young student he's just hired as his assistant thinks the big gizmo is "Beautiful." 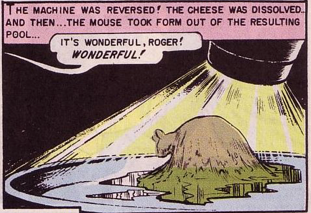 Lawrence tries the machine out on a mouse and the little creature is transformed into a slice of cheese. Why? Well, aide Sally has a theory about that. She thinks the restructuring is based on what the subject has on its mind at the moment. Roger is too blinded by Sally's headlights to shoot her theory down. When the professor's wife comes to call (and Sally and Roger have taken their working relationship to another level), Sally thinks fast and hides in the closet . . . well, no, actually she turns the machine on and is zapped into particles. For some reason, the gorgeous gal is realigned into a porcelain statue, which nasty wife Hannah bashes into a million pieces. After the old nag leaves, Roger quickly tosses the pieces back into the Re-Aligner but, as the naked babe is taking shape, he notices he forgot a sizable part of the porcelain on the lab floor. Uh-oh. 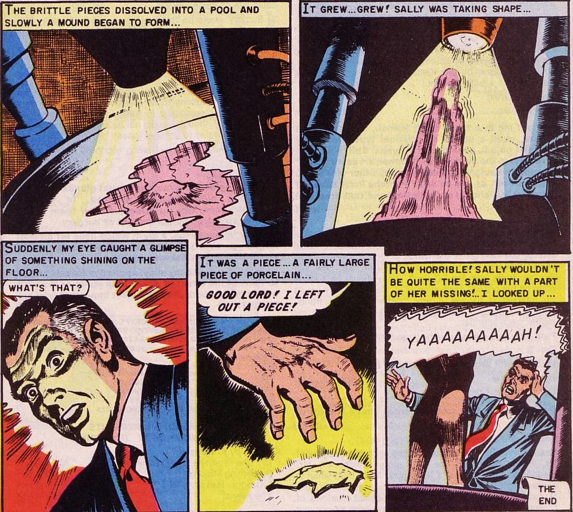 There's a fantastic final panel that (out of necessity or not) leaves up to the reader's imagination the location of the missing piece on Sally's body but, otherwise, this is a 7-page turkey that doesn't even have the knuckleheaded joy the previous Feldstein script employed. And then there's the Jack Kamen art. I'd say the "Something Missing" here is a coherent script. Jose: Yikes. This was not one of EC’s brightest hours.“It Was the Monster from the Fourth Dimension” will probably draw more wisecracks from the peanut gallery than Feldstein might have intended; all I can tell you is that the 7th grader in me could not help but draw the ribald conclusion that the dimensional rift was the SF equivalent of a glory hole and that the creature’s probing, swelling “extremity” was . . . well, there’s a scientist named Willy here to explain it to us, after all. “Something Missing” is just as bad but with hardly any of the perverse thrills. I say “hardly” because the notion of a human being reassembled from shattered materials with one piece left behind is fairly neat (likely the seed from which this turgid melodrama sprung), but the delivery is fumbled by Kamen who turns in some of his driest work to date. 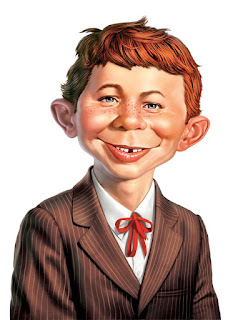 Kurtzman’s goofball yarns have been steadily declining in quality, and one can only hope that “Gregory Had a Model-T,” a corncob tale that leans more heavily towards fantasy than SF, will prove to be the final, wearying pit stop before we pull back onto the road to recovery. 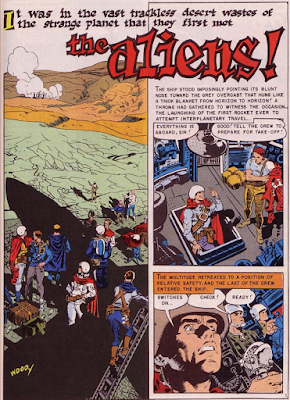 By the issue’s end, the reader will be so weary and desperate for succor that Wally Wood’s “The Aliens” will be viewed as a possible beacon of hope, but while the artist’s compositions are as assured and able as ever, the story never seems to reach full boil, and draws the whole show closed with a feeble simmer. Jack: I think that Peter and Jose have said about all that needs to be said about "It was the Monster . . ." I thought it looked like floating Silly Putty. In "Something Missing," I was very curious as to what piece of Sally was missing and why it elicited such a reaction from Roger. What's the big deal? Just toss in the extra piece, melt her down again and then bring her back whole. Sometimes these brilliant scientists just don't think! I enjoyed Kurtzman's story and it made me realize, yet again, that Mad did not come from nowhere--it was the logical destination for the zany side of comics that creators like Kurtzman had been exploring. "The Aliens!" dazzled me with its art and surprised me with its conclusion. It was obvious that the spaceship landed on Earth but less obvious that the hostile people encountered were also space travelers! John: Right from the start, I thought "It Was the Monster from the Fourth Dimension" was going to be a hoot that Ed Wood would have been proud to have written. Unfortunately, once the brother shows up on the scene and points out what's really going on, that it's clearly an inter-dimensional being from the fourth dimension (which I literally laughed out loud at), it was all downhill from there. "Something Missing" has a classic twist ending, but takes far too long in getting there, as we've seen many times before in EC's lesser efforts. While "The Aliens!" has nice Wally Wood art to look at, it's another case of been here (to this Earth-like planet), done that. 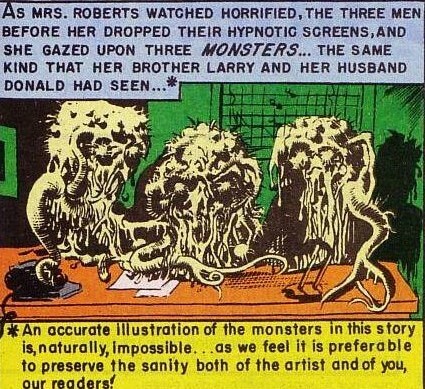 The title and the description of "It Was The Monster From The Fourth Dimension" sound just like one of those especially campy Atlas-Marvel stories, the kind that got reprinted constantly in "Where Monsters Dwell," "Where Creatures Roam" and others. I've never stopped being sentimental about those. Peter is right there with you! Thanks for commenting. "The Basket" is one of my favorites. 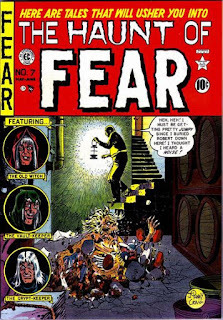 It is interesting to compare the earlier Ingels story with Davis's take on the theme, even more so considering Ingels drew the story when Feldstein recycled it for the Picto-Fiction title Terror Illustrated #1, using the same title. Davis's style has an intrinsic humor to it which I enjoy but I prefer the Ingels version of "The Basket" because of the Gothic look of his style. Ingels could also do regionalism very well, though he was better suited for Poe-style New England Gothic. Thanks, Jordan. I can understand your preference for Ingels over Davis!